My Dad was in Air Force when we (me and my brother) were small. So we had to constantly move around as part of his job. We got the opportunity to travel a lot in the northern part of India. My childhood memories of North India lingers around the festival of light called 'Diwali', which is an auspicious occasion for kids to enjoy galore of sweets. Our whole building complex will be decorated with small clay lamps which still remain as a spectacular view in my memory. It is a time of celebration with lots of fireworks. My brother was brave enough to play with sparklers even when he was small, but I would dodge behind my Mom by closing my ears so tight with my hands. I don't think I have changed much from that, I still close my ears to loud noises of the fireworks. The celebration of Diwali is not restricted to Northern parts of India. It had traversed across the globe and at this time, you can see different varieties of sweets in Indian stores and people line up to buy these goodies. These sweets are heavenly I would say, and Burfi is my favorite. My daughter also loves Indian sweets, her favorite is Burfi too. I make these burfis at home. Since Diwali is around the corner, I would like to share this recipe with all of you. Using a hand mixer, mix the ricotta cheese into a thick paste. Take a non-stick pan and add the cheese to it and cook for 3-4 mins, it will start to loosen up. Add a tsp of butter and stir continuously. Add the sugar, milk powder and pistachio powder and keep stirring till it forms a thick dough or when it starts to separate from the sides of the pan. It took 20-25 minutes of stirring for me. Add the cardamom powder and stir for another 1 min and turn off the stove. 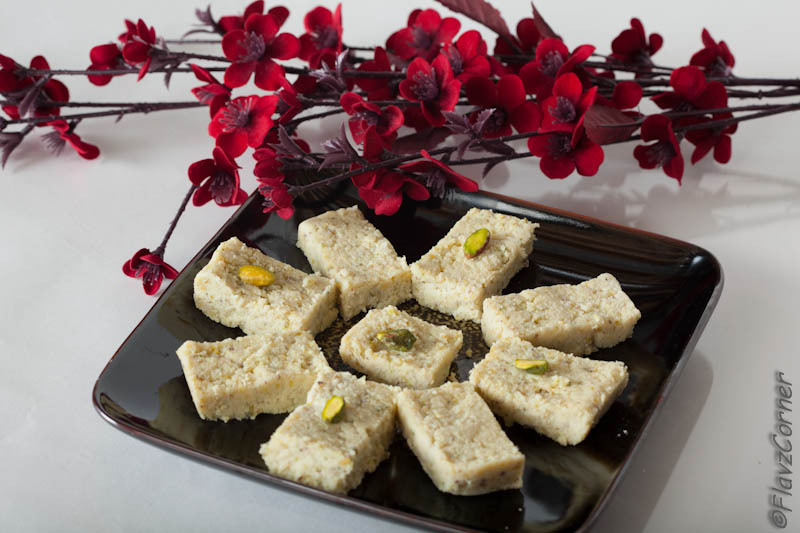 Apply little butter on the glass container/bakeware and transfer the burfi to the container. 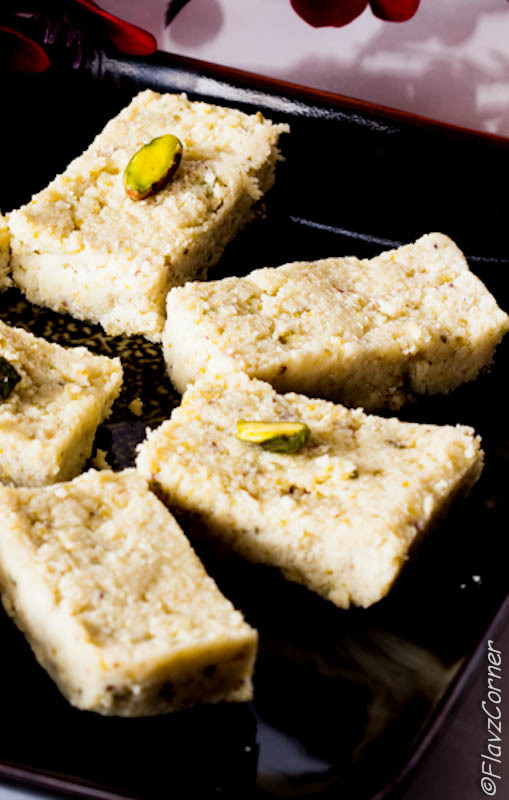 Apply little butter and flatten the burfi using a spatula or spoon. Garnish it with halved pistachios. Cover it and refrigerate for 1 hr. It can be sliced into desired shapes. You can substitute pistachios with cashew nuts or almonds too or totally skip the nuts. If you are not adding the powdered nuts, make sure you substitute it with milk powder so that the burfi can be set easily. I used Miceli’s Traditional Ricotta cheese and Carnation Milk Powder. I also made something similar for Diwali :) I love Indian sweets and the availability of ricotta cheese makes it so easy for us to make Indian sweets at home:) Your recipe looks good. Happy Diwali to you!!! Thanks Shema!!! Its absolutely true, the ricotta cheese comes handy to make Indian sweets. Hope you had enjoyed the sweets you made. If it is something different, do post it!! I can almost taste that burfi...I bet it was creamy, sweet and delicious!! Happy Diwali to you and your family! !